Fantasy is now en vogue following the rise of hit franchises like The Lord of the Rings, The Hobbit, and Game of Thrones. Microgaming casinos have a bunch of fantasy slots to play, but one of the standout options would have to be the Forbidden Throne slot. The fundamental ethos of Forbidden Throne is the coming together of ice and fire, with various symbols and imagery devoted to presenting this image. 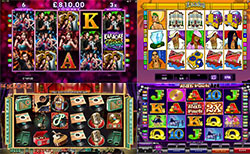 In May 2017, the slot was of a high graphical standard when released, with the various images artfully designed. There are many gems and relics that can appear next to the tall character symbols that can fill multiple places on the slot’s five reels and three rows. Many types of symbol arrangements can lead to payouts from the slot’s 40 fixed paylines. The five relic symbols will all pay out higher multipliers when compared to the more basic coloured gems. Wagering at the top end of the scale can vary depending on Microgaming casino sites – so be sure to check the levels that are in place. Nevertheless, it can be confirmed that the wagering scale does begin from €0.40, considering that the 40 paylines always remain active. • Wild symbols: the Forbidden Throne logo is the wild symbol and carries the power to substitute for most of the missing symbols except for the scatters. • Wild reels: every spin will cause one of the reels to be completely wild, and will be represented by the icy horse, icy warrior, palace, fiery warrior, or fiery horse. • Free spins: pay attention for the golden orb scatters symbol as the landing of three, four, or five will deliver 10, 20, or 30 free spins, respectively. In conclusion, Forbidden Throne is a strong option when considering the visual quality, mobile compatibility, and lofty return to player (RTP). It’s also a positive that the Forbidden Throne slot comes with wild symbols, wild reels, and free spins. Nevertheless, it would make the Microgaming mobile slot even more appealing if there was a bonus game to heighten the experience.